Before you begin, make sure you have everything ready to go - the cream and the butter next to the pan, ready to put in. If you don't work fast, the sweetener will burn. Heat butter on high heat in a heavy-bottomed 2-quart or 3-quart saucepan. As soon as it comes to a boil, watch for specks of brown (this is brown butter....SO GOOD on veggies!). Immediately add the Swerve and the cream to the pan. Whisk until caramel sauce is smooth. Let cool in the pan for a couple minutes, then pour into a glass mason jar and let sit to cool to room temperature. Store in the refrigerator for up to 2 weeks. Once it is cooled a bit (it will thicken), place a TBS onto a cluster of pecans. Place in fridge to set. Caramel will thicken even more. Meanwhile, chop the ChocoPerfection bars. Heat in a double boiler until chocolate is melted. 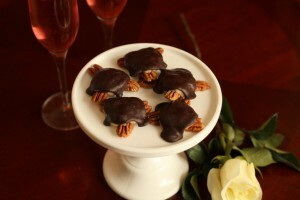 Drizzle chocolate over cooled caramel covered pecans. Enjoy!